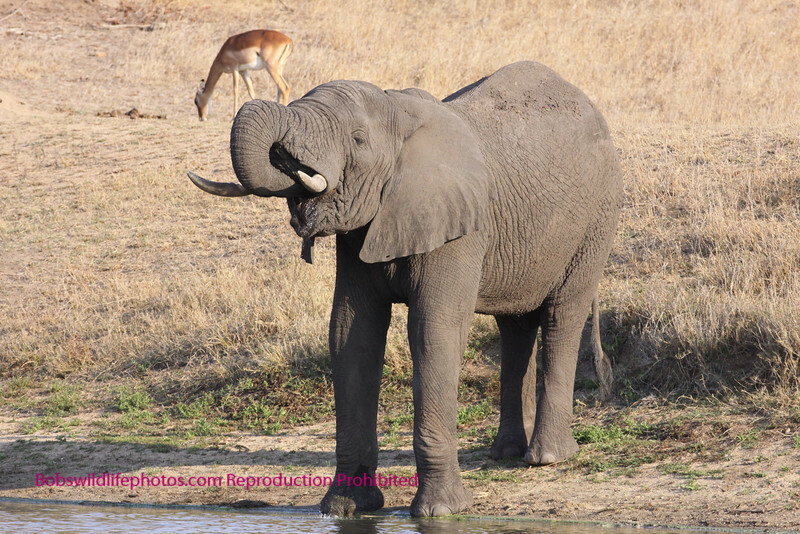 The African elephant is the largest land animal reaching a weight in excess of 7 tons. They are generally nonagressive, but can be extremely dangerous, particularly when they have young or are in rmusk. Mock charges are common. In the mock charge, there may be trumpeting, ears spread wide and trunk raised. They are more dangerous when charging with the trunk down and ears tight to the side of the head. (A mock charge from an elephant got my heart going one time in Nkorho.) The elephant in the road below, caused us to go in reverse QUICKLY. This elephant was in Etosha Namibia.They tend to live to about 70 and often die of malnutrition or other natural causes. Malnutrition/starvation, occurs when the last set of teeth is worn down and the animal can no longer chew to ingest nutrients. Other natural causes also bring about their demise. In Sabi Sands we came on a pride of lions feasting on a young female (see african lions). It turns out she died of constapation. Elephants are seldom the victims of predators. (except man) They live in matriarchial groups. Large bulls tend to stay off by themselves, joining the herd only when a female is in oestrus and leaving after mating is completed. A mature elephant has no natural predator but man. Newborns can and are sometimes taken by lions. They can be destructive, pushing over small and not so small trees to get to the leaves. In Kruger this year and last we saw large areas laid waste as they searched for food. In this gallery you will see photos of a couple of elephants and a rhino near the Nkorho water hole. The rhino was in the hole rolling when the elephants came. They actually chased him out of the water. The majority of elephants in this gallery are from Etosha park in Namibia, and Kruger Park South Africa. In Kruger most were taken in the area of Olifants. It was near Olifants that we saw two bulls kicking up dust. They made about three mock charges, kicked up a lot of dust and then walked off. They are truly a magnificent sight.